Special Fluke/Flounder Trip - Sunday - August 2nd - 6:30AM to 4PM - $125.00 - Long Run Likely - Looking to get over good fish - Reservations Required.. Absolutely Cannot Predict Which Species Will Bite Better On Any Given Day. Very Firmly: If you positively want one species & not the other you can watch the gut bucket to see which day would have been best for you. Fishing has been OK, which is always better than not fishing at all. Sending almost every party home with a fish fry's worth at least - but it requires work. We cannot know what will bite better on any given day until the bite is over. Saturdays 6:30 to 3:30 - $125.00 – Otherwise 7 to 3 at $110.00. Dramamine Is Cheap Insurance! Crystalized Ginger Works Great Too. It's Simple To Prevent Motion Sickness, Difficult To Cure. If You Suffer Mal-de-Mer In A Car You Should Experiment On Shorter Half-Day Trips First! (Wockenfuss Candies sells crystalized ginger locally - Better is Nuts.Com.. Chewable Meclizine is a good pharmaceutical with Scopolamine Patches the gold standard.) For Anglers With Known Issues Dramamine & Meclizine Work Best If Treatment Begins The Night Before..
Been some very kind days, but no boat limits of flounder. On one trip we had a fellow with a 10-minute limit: 4 drops, 4 fish. Sweet. No, that's not what you're going to do. Especially if you can catch like Mark does. If you're a hack like me ..well, we work at it. That day we had a great show from a pod of Atlantic spotted dolphin. They'll pile-in under the bow and swim for long periods. Always wonderful, especially if you've never seen it before. Seeing some loggerhead turtles & just a few leatherbacks. Must have been a month ago Wes & I saw an albatross. He and I don't count in the bird world. The only confirmed sighting I'm aware of off Maryland's coast was in 1975. I saw another in 1995, and then this one. Mate Wes: "Hey Cap, what kind of gannet is that?" The yellow-nose albatross; enormous with black & whites starkly cut, and so entirely different in flight & shape than birds we see every day, was point blank. Time I gave Wes a camera & jammed her throttles up full, bird was gone. So, like the youngster who took his picture with a jumbo fluke last week only to have it jump out of the cooler & slip thru a scupper then swim away, our "big one" (at least in the bird world) got away. Our young angler, at least, has evidence.. So very much gets away in way of opportunity. Here's video of an Iron Lady concrete reef deployment from this past April shot by a local diver. https://www.youtube.com/watch?v=EkgshKqq1F8 Bryozoans own the concrete for now. There will be many battles waged by the animals that wish to attach to the reef. Corals will win in the end.. I promise - Maryland has no idea the power of artificial reef to restore water quality; lessen substantially the burden now borne by our farmers via oyster biofiltration; enliven fisheries production with increased habitat; protect shorelines, & create fantastic increases in landings for both commercial & recreational fisheries. Who would have guessed we have corals & sponges in our back bays? We have so many more in the ocean. No government agency has them on their 'to do' list. What we really have is no idea whatever of how to successfully restore fisheries production where habitat was lost generations ago. Now it's going to get worse. Maryland's one-man "Artificial Reef Program" just received a transfer. I'm told, in finely honed vagueness, we'll see a replacement soon. Chesapeake Bay has the single greatest loss of hardbottom in the world - all studied down to the cubic meter. And we currently have not a single full time DNR staffer devoted to artificial reef building. Ocean's turned greener & greener these last 70 years. We'll need oysters in grand fashion to turn it blue again. 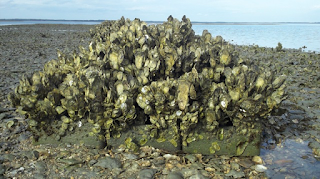 In the pic below is an oyster-shell pile within The Nature Conservancy's Virginia Preserve. They too were told, "You CAN'T grow oysters back here." Except they did. More oysters in those little back bays than in ALL of the Chesapeake. See any oysters growing on shell? How about the concrete blocks which offer a hard vertical substrate? Not-so-much on shell. Shell mimics a dead reef. Vertical substrates mimic a live reef. Oysters cannot tell the difference. They just grow better & live longer on vertical substrates. That means they spawn better too. Oyster Castle Blocks in TNC's VA Preserve covered with multi-year natural spat.. In 1934 bluewater fishers had to go a few miles to catch marlin. One skipper told me he had only to troll from Great Gull Shoal (5 miles out) up toward Fenwick Shoal. In the 1960s Jackspot was the rage. Ocean City was "The White Marlin Capitol of the World" ..because of a shoal that rarely ever has bluewater today & rarer still has marlin. Next week marlin fishers will run to canyon's edge & beyond looking for blue water in the White Marlin Open. Sport fishers 'repair' for our greening seas has been faster & faster boats along with satellite imagery. They can still find bluewater..
Our region's farmers are tasked with restoring water quality in the Bay without aid of oysters. How fantastically myopic to hold farm-field runoff as the cause of our great bay's decline. Our region's oystermen enjoy spat on shell plantings that are essentially no different than put & take fresh-trucked hatchery trout in a pond. It seems as though they just do not like any oyster they're not allowed to sell. In 1920, Reginald Truitt, founder of the Chesapeake Biological Lab, envisioned gigantic concrete broodstock preserves so there would always be sufficient natural oyster spat. Now we need giant biofilters to turn the ocean blue & give our farmers their land back; ease their burden at least. Was a lot of oyster bottom set aside in the last administration - No Take Preserves. Oyster restorationists also started using rock instead of shell as a substrate for reef building. Lot of vertical surface in rock. Watermen did better on oysters last winter than they have in a long, long time. Funny what happens in a fishery when there's good habitat for survival & plenty of spawn. Might be a method of fisheries restoration..